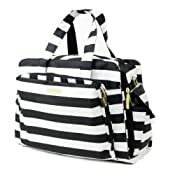 The Ju-Ju-Be Legacy Collection Be Prepared Diaper Bag is a smart bag with innovative designs and spacious compartments. Keep yourself ultra-organized with (17) friendly pockets that make it easy to tote along all your daily essentials. Are you an over packer? Do you have more than one in diapers? Twins? 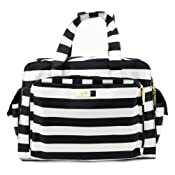 How about the perfect bag for overnight trips or the airplane? The largest in our line of diaper bags, the Be Prepared will help you be just that, prepared. The lining is protected with an Agion natural antimicrobial treatment that inhibits and reduces the growth of odor-causing bacteria, mold and mildew. The outer fabric is treated with Teflon fabric protector, making it easy to repel stains and keep it clean. The "mommy" pocket is large enough for smartphones, wallets, keys and other personal items. Inside are (4) pockets with a sunglass holder and a key fob stretch cord. A snap closure pocket is located on the front of the bag and ideal for books. The main zipper pocket is large enough for diapers, wipes, extra clothes and other items. 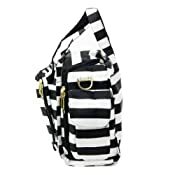 This spacious area also includes (7) smaller pockets with (2) sets of colored tabs to help distinguish different items. The back pocket is designed with crumb drains to keep this area clean and includes a super cushy memory foam changing pad. Bottle pockets with magnetic closure flaps are located on either side of the bag and insulated to keep items hot or cold. The First Lady print is accented by gold colored hardware, including luggage feet to keep the bottom of your bag clean when you set it down. This bag is machine washable and measures 18.5-inches by 14-inches by 6.5-inches in size. 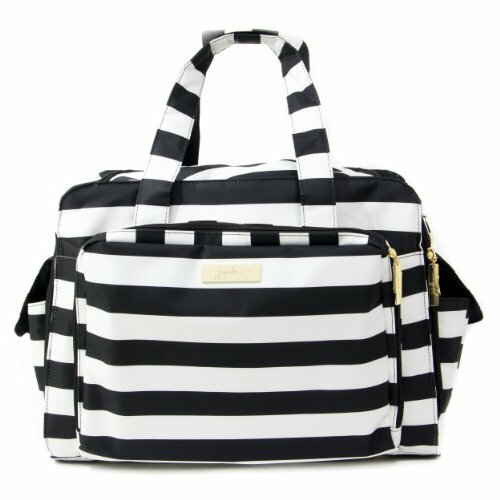 The Ju-Ju-Be Legacy Collection Be Prepared Diaper Bag comes with a 90-day limited warranty to protect against manufacturing defects.